when your world is darkest. Beloved missionary Sarah Young shares another deeply spiritual devotional to help readers grow in grace, hear from God, discover hope, and walk with Jesus Today TM. 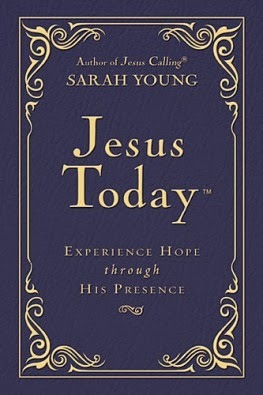 In Jesus Today, readers will be renewed with a deeper sense of hope as Sarah shares this about her spiritual journey in writing the book: "When I began writing Jesus Today, I was deeply discouraged by the failure of many months of intensive medical treatment to improve my health. However, the longer I worked on the book—focusing on finding hope in Jesus—the more hopeful and encouraged I became." Whether readers are needing a lifeline in discouragement, or simply longing for an encouraging boost, this devotional book — a sequel to the #1 bestselling Jesus Calling ®—will speak hope into believers’ lives. It is written as if Jesus is assuring that He is in control, that He is good, and that a glorious future awaits all who anchor their hope in Him. 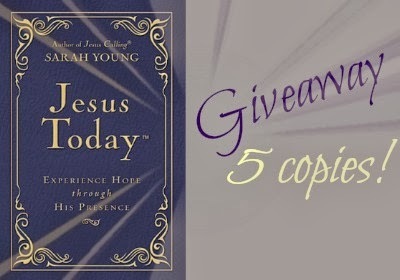 Millions of lives have been touched by the writings of Sarah Young's Jesus Calling products , and this deluxe edition of Jesus Today is a beautiful addition to this bestselling brand. please click here to open the widget in a new page and enter today. Would you like to see an inside glimpse of this gorgeous devotional?Check it out! !